Quebec's transport minister is proposing a new way to compensate taxi drivers as it seeks to change the industry – by putting the onus on clients. Transport Minister Francois Bonnardel says he expects the new fee will be in place for five to six years and will be covered by the customer. The goal is to amass $270 million to reimburse taxi drivers for their medallions. For weeks, drivers have been protesting by tying up traffic on highways and in the downtown core. They claim the government's efforts to overhaul the industry will leave them bankrupt - some say the only solution is to ban ride sharing services like Uber. Many drivers took out loans to buy their medallions. A decade ago it was an investment nearly equivalent to buying a house. However, since ride sharing services have come into the market, taxi drivers say they’re being undercut. A large number of the taxi drivers say $270 million isn't enough compensation, considering the buy-back rate is what drivers paid initially for the medallions, and not what they're worth now. Despite this, Bonnardel said repeatedly during this morning's news conference he's the best friend the industry has. “It’s false. It’s not true. They will have a job. They will put more money in their pockets with this bill. I’m telling them this morning what we announced today; I’m telling them we’ll continue to have a discussion,” Bonnardel added. 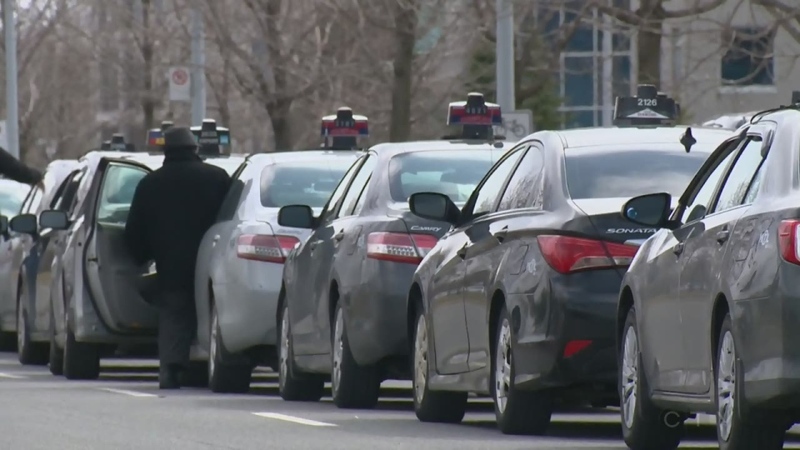 Representatives from the taxi industry met with the minister Monday morning before the announcement, and many were surprised and disappointed with the government’s solution. Bonnardel said drivers will have a future in the business. “It's not true saying that after the bill will be adopted that all the taxi industry will have no job. It's false. It's not true. They will have a job. They will put more money in their pockets with this bill,” he said. “This business will be only for part timers. It won't be a business for people they could work and make a living,” said taxi permit owner Edgard El-Kalaani.